As we move further towards cashless economies, a need for secure transactions becomes more and more important. Cryptocurrencies are seen by many as the future of transactions and a way to ensure security. This in itself, is nothing new. Since the ‘dark days’ of the 1930s and ’40s when cryptography was used to secure communications in times of war, it has now evolved to more broadly protect information and money online. Yet the general public’s understanding of cryptocurrency is minimal at best and often confused. Put simply, cryptocurrency is currency that is tracked by a single decentralised ledger system known as a “blockchain”. That opens up a whole range of questions, but what follows here is what we hope a clear explanation of cryptocurrency and the power it may wield in the future. You may have heard of Bitcoin, given the mystery surrounding it as well as its recent fluctuations in value (currently approximately AU$8,600 at the time of writing - after hitting highs of over AU$25,000). The once-obscure digital currency advanced more than 1,500% last year, boasting a market cap of some US$280 billion – bigger than the likes of IBM, Disney, Nike and McDonalds. Created in 2009, the success of Bitcoin led to the creation of many other cryptocurrencies. coinmarketcap.com tracks 688 of them and counting. According to coinmarketcap.com, the thriving cryptocurrency ecosystem total valuation currently sits north of US$400 billion - but again - this fluctuates wildly - and the number is only accurate at the time of writing. Like any currency, cryptocurrency is a means of exchange to purchase goods and services. 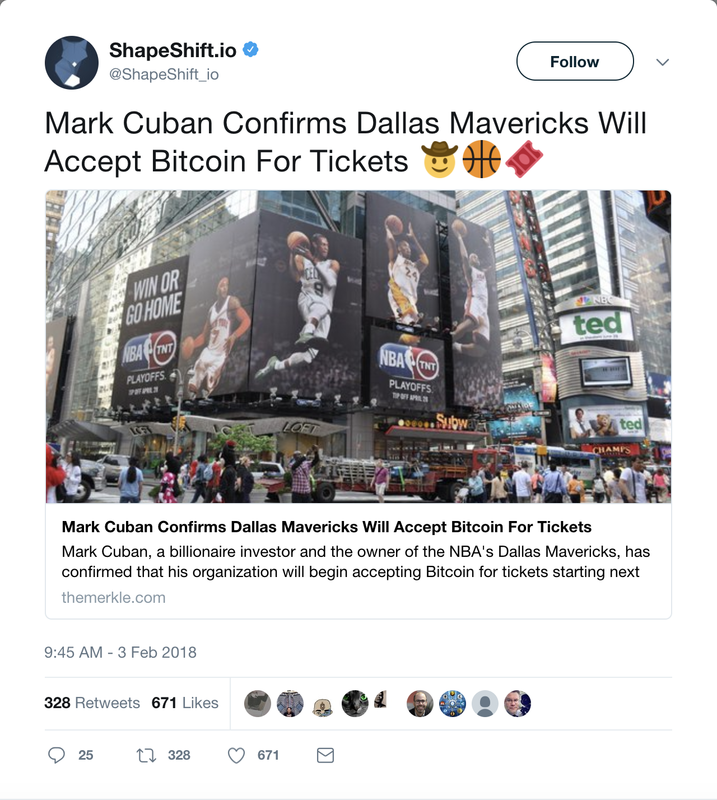 Dallas Mavericks Owner Mark Cuban recently announced that his team’s basketball tickets could be bought with Bitcoin or Ethereum. Microsoft products can also be purchased with cryptocurrency. If you think this is a flash in the pan, look to Japan where over 25,000 businesses are registered as being set up to receive payment with cryptocurrencies such as Bitcoin. Exchange is just one way to use your crypto. Investors can use cryptocurrencies as a speculative investment and take advantage of potential appreciation. This could provide a high return, but is also a high risk investment with no guarantee of success. The one thing underpinning cryptocurrency is the blockchain. Put simply, blockchain is a decentralised digital ledger in which transactions made in cryptocurrency are recorded chronologically and publicly. Once a transaction is made, it is instantly known by the peer group, can no longer be changed becoming part of the permanent record of network transactions, which make up the blockchain. The blockchain records all transactions ensuring that all entries can only be added when secure protocols are met - the verification of these protocols is completed by a process called mining. The only difference between standard fiat currency and blockchain recordings is the centralised database: cryptocurrency has no central database. So what defines a cryptocurrency? Several things actually. Permanent transactions. The confirmation of a transaction within blockchain means it cannot be changed. Anonymity: Transactions are only traceable via wallet address (similar bank account number). Secure: This goes back to the security of cryptography, with all account holders holding private keys that are almost impervious to crack. That doesn’t mean the blockchain can’t be hacked, or a digital wallet stolen, but overall your currency is pretty safe. A lack of trusted third parties: Remember, this is not your commonplace financial system and there are no intermediaries or middlemen to facilitate the transactions and interactions between two parties. Finite. Limit on how many of each coin will be made available for circulation are commonplace amongst cryptocurrencies. Bitcoin supply will decrease over time and will reach its final number of around 21 million coins by around the year 2140. So how do you purchase Cryptocurrencies? Just look up exchanges such as Coinspot, Binance and Bittrex and you can see how it all works. They have their own buying and selling processes and actually make transactions easier to understand than the guy in the pub telling you how much he lost when he used Bitcoin to purchase a pizza. 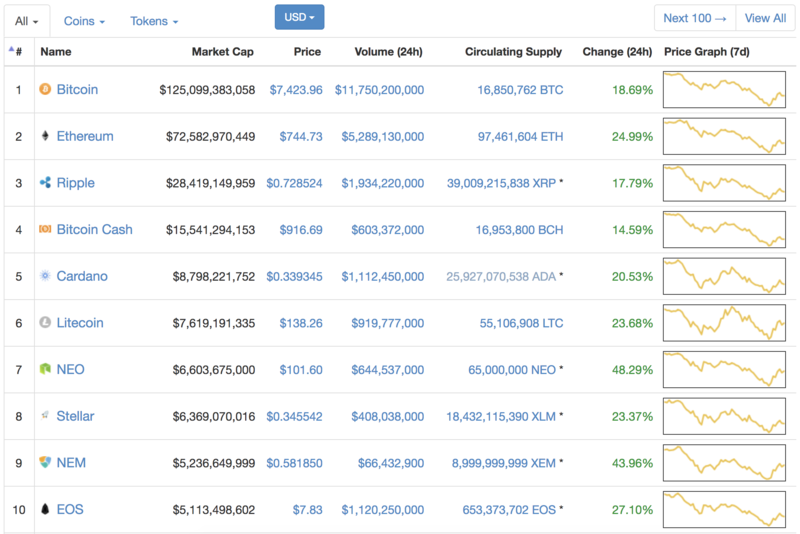 Whilst Bitcoin is still the dominant cryptocurrency, there are plenty on the rise including a few alt coins (that means 'alternative' coins in case you were wondering) that seem to be making a splash including Ethereum, Ripple, Litecoin and Monero. Well, first things first - investors should do some serious due diligence before making a decision about which crypto to buy, and seek professional financial advice. Some of the lesser known currencies may have more room for growth than those that are well established. However, its a very volatile market and no one knows exactly what the future will hold for investments of this nature - nothing is a safe bet. Whilst the cryptocurrency space faces numerous risks, and no one should enter a cryptocurrency market without doing their due diligence, it is likely that many of our future financial ledger systems will be created from blockchain technology. Immense value grows and disappears overnight when speaking of cryptocurrencies. Fortunes can be made and lost in an instant, but there’s no denying these new currencies and the technology behind them will have a major impact on the way we transact in the future.